Who doesn't love a good mini-break? A chance to escape the hustle and bustle of the city and have a change of scenery, does wonders for the soul. Victoria has a diverse range of destinations for a weekend or mid-week getaway, so we're really spoiled for choice when it comes to choosing where to go. Over the next few pages you will read about 5 regions of Victoria which each offer their own unique getaway experience. You're sure to find one which floats your boat. Delightful Daylesford is located north-west of Melbourne City, right in the heart of spa country. Only an hour's drive from the CBD, it is perfect for a girlie weekend or a romantic retreat. Day spas and alternative therapies abound, so you can get into some serious relaxation after a stressful week at work. The many wellness centres here use water from the naturally occurring mineral springs which are central to this region. Other attractions in the area include delicious local food and wine served in trendy eateries, which will definitely appeal to the foodies. For some retail therapy, hit the shops and give your credit card a workout in the many boutiques and galleries. You'll find everything from vintage collectibles to local art. To find out more of what Daylesford has to offer, including accommodation options, click here. 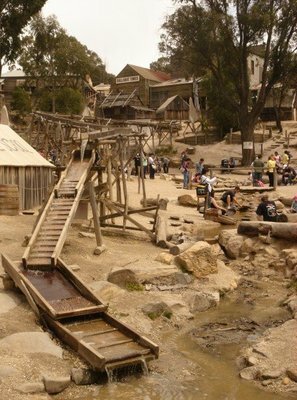 Sovereign Hill is Ballarat's prime tourist attraction. Here you can pan for gold, explore an underground mine and experience what life would have been like in a gold mining town during the great Goldrush in the 1850s. There's also the option of seeing the highly acclaimed Sound and Light Spectacular, 'Blood on the Southern Cross', which tells the story of the struggle between gold miners and the Government in 1854 which ended in great bloodshed. The Ballarat Wildlife Park is a great place to get up close and personal with some native Australian animals. You can hand feed the kangaroos and listen to the keeper talks which are scheduled at various times throughout the day. If the kids want to let off some steam there is an enormous adventure playground on the shores of Lake Wendouree which will keep them occupied. You can also take them for a trip on the vintage electric tramway located within Ballarat Botanical Gardens, which is part of the Ballarat Tram Museum. For more details of this beautiful, historic town and places to stay, click here. 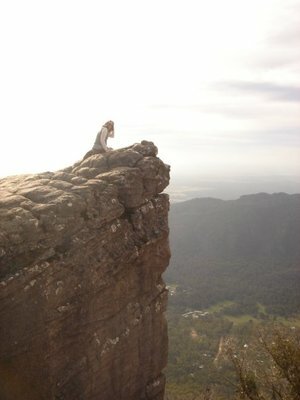 The Grampians is a mountain range, located to the west of Melbourne. A 3 - 4 hour drive from the city, this getaway is probably more suited to a long weekend or mid-week break. The town of Hall's Gap is the main tourist centre and there are plenty of accommodation options here catering to every budget. The main activities in this region are walking and climbing in The Grampains National Park and surveying the absolutely stunning views you will be rewarded with. There are also many aboriginal rock art sites, an abundance of wildflowers (particularly between August and November) and plenty of native animals roaming around, so there's plenty to keep you occupied. There are a number of fantastic lookouts and tracks to experience, so do your research before you go to find out which ones you want to tackle. My favourite spot is The Balconies, formerly known as The Jaws of Death. If you climb down onto it, you'll find out how it got its original name. This is a great break for all thrill seekers, from the not-so-adventurous to the if-it-doesn't-kill-you-it-will-make-you-stronger types, because there is something to suit everyone. The Yarra Valley is positively bursting with wineries, breweries and stunning natural scenery. Only an hour's drive from Melbourne, this is a great choice for a short weekend break and would especially suit couples or a group of friends. 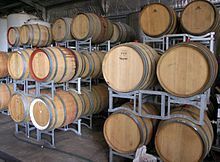 Tour the region sampling wines, cheeses and other delicious local produce before walking off the calories in the rolling hills. This is a getaway with the emphasis on luxury, so treat yourself to some upmarket accommodation options. You can also check out attractions such as Healesville Wildlife Sanctuary or have the best of both worlds with a Wine and Wildlife Package. Healesville Sanctuary and De Bortoli are offering the perfect Yarra Valley day out. Enjoy a two course lunch at De Bortoli Winery and Restaurant, followed by your very own personalised tour of Healesville Sanctuary. 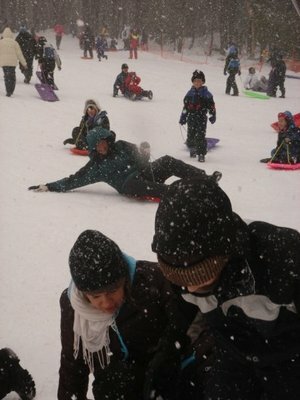 Lake Mountain is the closest and most affordable ski resort to Melbourne CBD. Two hour's drive will see you there safely. This is not suitable for those snow bunnies looking for high-octane ski runs, or serious snowboarding dudes looking to catch some 'phat air'. It is suitable for those wanting some good old-fashioned fun in the snow with friends and family. During the winter Lake Mountain is covered by a beautiful blanket of deep, white, fluffy snow. It is Australia's top cross country ski resort, with more than 30km of ski trails to explore on skis or snow shoes. There are several different toboggan slopes, which are fantastic fun to fly down, or you can build a snowman and throw snowballs at your kids. This excellent website will tell you everything you need to know before you go, including where to hire your snow gear from, how much it will cost, what activities are on offer and where you can stay. The other good thing about Lake Mountain is, it stays open all year round and out of the snow season offers other outdoor activities, such as dune buggies, paint-balling, mountain biking and 2 enormous flying foxes. These Adventure Activities run on weekends, school holidays and public holidays (excluding Anzac day) from 9am to 5pm. All the details are also on the aforementioned website.